Ethelwold House is a stunning period house with a peaceful, spiritual bent. 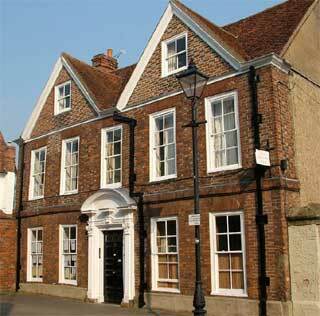 The house offers value for money bed & breakfast accommodation in Abingdon's deeply historic centre. Whether you come here on somekind of spiritual quest or whether you are a family or individual just seeking a roof for the night, you couldn't be in better hands. There are few bells and whistles here but the quality of the rooms and the sheer amount of space means you can kick and back and relax in comfort. The house occupies an enviable position just off the River Thames and close to St Helen's Church. Abingdon's main shopping throughfare and the Country Hall Museum is just a few minutes up the road. Here you'll find the usual brands and names like Costa Coffee and WH Smith. The gardens back onto the Thames and the atmosphere is friendly and informal. There are several bedrooms on offer including single, double, twin rooms and a family room. Each room has heaps of Tudor character and charm and several have cooking facilities. The exposed oak beams and cast-iron bed frames are a particular delight! Sadly, none of the rooms are en suite but there are plenty of bathrooms on all floors and each is decorated and equipped to a very high standard. A continental breakfast is served at Ethelwold House on weekdays. The dishes offered are organic where possible and include home-made muesli, fresh bread/croissants from the local French patisserie, fresh fruit salad and yoghurt. Telephone the house on +44 (0)1235 555486 to learn more.